Today is the day you’ve all been waiting for with eager anticipation—the official unveiling of the Junto’s March Madness bracket! Thank you to all who nominated books over the last couple of days—this whole project wouldn’t have been possible without you. As with last year, we had an overwhelming response to our call for nominations, with over 150 books nominated, and over half of those receiving multiple nominations or seconds. 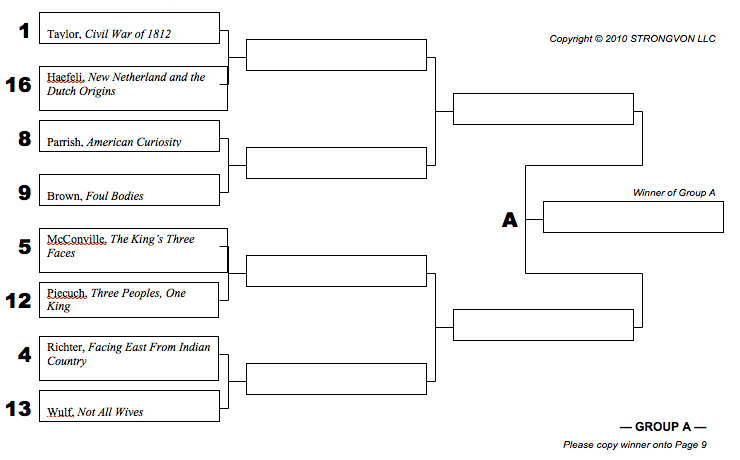 Constructing the bracket from such a list was a difficult—each of us had to see books we wanted in the tournament fall by the wayside. 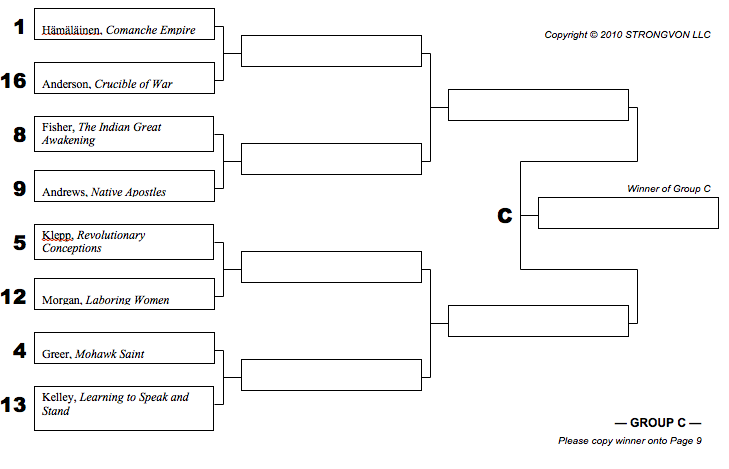 1) Seeds 1 through 8 were primarily decided according to those books which received most nominations and seconds. 2) One book per historian. 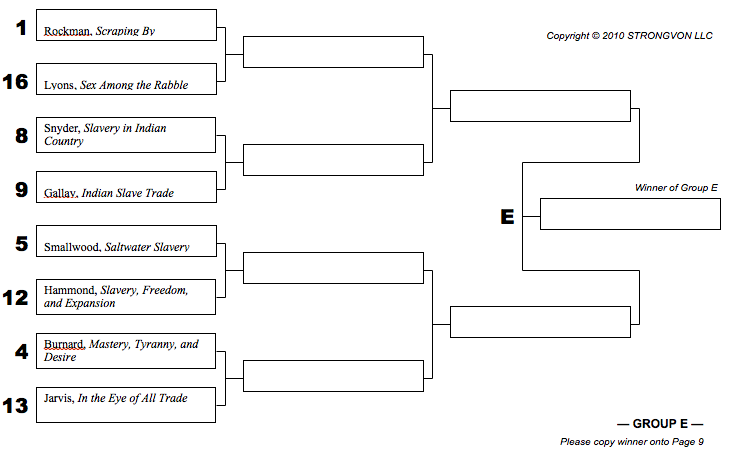 3) Books were generally assigned to brackets 1, 2, 3 or 4 based on general themes—transnational/religious history, race/Native American/gender history, race/slavery, and political history—but these were not hard and fast rules. Just as Gonzaga sometimes ends up in the Midwest in the NCAA tournament, so sometimes we had to shift books around to keep the seeding roughly in line with principle 1. 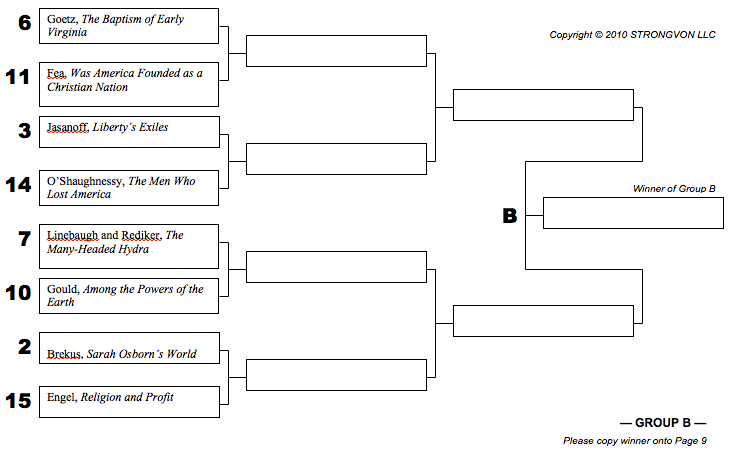 4) For seeds 9 through 16, we simply tried to create matchups that would spark discussion. In case the principles outlined above didn’t make it clear, this is designed to be frivolous and fun. I repeat . . . THIS IS MEANT TO BE FUN. If any subfields or subtopics seem underrepresented, it is simply because the sample size of persons nominating the books was very small in relation to the size of the field. We’re not out to find the “best” book in early American history; we simply want to have fun, interesting and informative conversations about early American historiography. So, when voting, please keep that in mind. Don’t feel you must vote for the book you necessarily think is the “best,” but the one that is your favorite of the two. 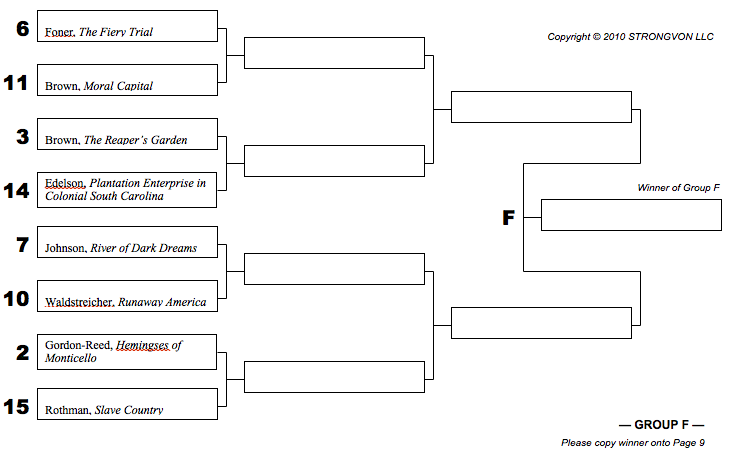 This year, we’ve also created a hashtag for discussion of the tournament on Twitter: #JMM14. Which books deserved more praise? Which are the most interesting match-ups in Round 1? Let the conversation begin! And for those of you who like print-outs, you will find images below. 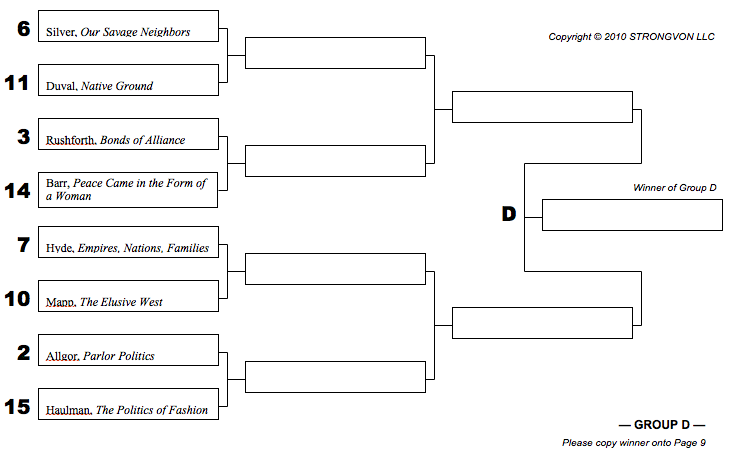 You can download a PDF Bracket. Interesting how you used the British version of O’Shaughnessy’s title; show’s the Junto’s transatlantic character I guess. The British may have lost the war, but they still win the Junto’s respect! That would be because I was in charge of standardizing names/titles for brackets 1 and 2, and my browser automatically directs to Amazon UK. We are at the mercy of our readers’ nominations. 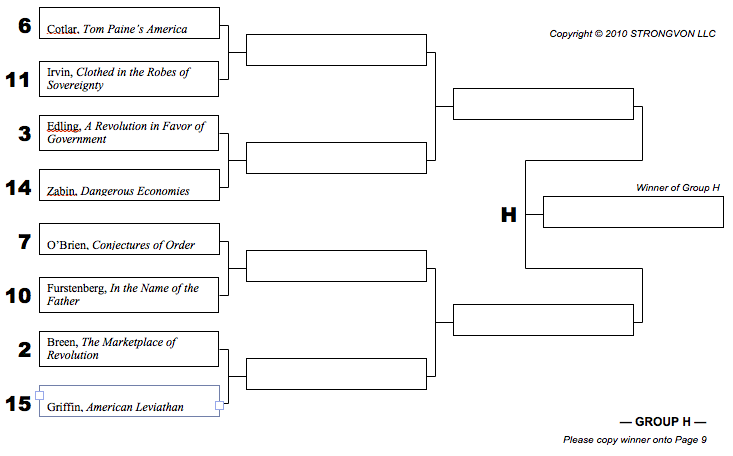 We heartily encourage more nominations of books that cover economics and war next year! I’d go further than that, Ben. 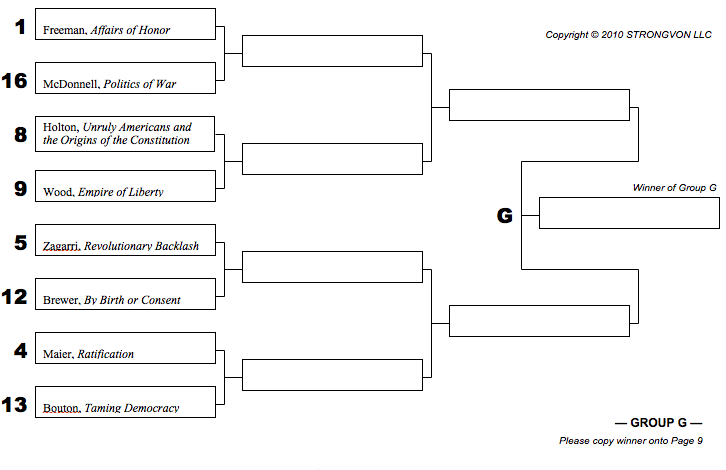 Many of the books in the bracket I’d deal with either economics or war – including the number 1 overall seed, Alan Taylor’s Civil War of 1812. Few of the books are military histories of war, but significant numbers cover war in some way shape or form – including a large number of the books dealing with Native American history. Similarly with economics. What is Seth Rockman’s Scraping By if not a book about economic conditions? Bouton, Holton and McDonnell all deal with economics in significant chunks of their books – McDonnell’s with war, too, as the title makes evident. Simply put, books can deal with race, class, gender, AND economics and war. It might not be the military history of detailed recounting of troop movements, But it’s still war, and most people experience the social ramifications of war more than the military battles themselves. Just because there’s a race or class angle to a book doesn’t mean it’s the only thing on discussion.